BINGHAMTON, NY – The Andrew Goodman Foundation (AGF), a national nonprofit organization supporting youth leadership development, voting accessibility and social justice initiatives on campuses across the country, visited Binghamton University to meet with administrators and staff from the Center for Civic Engagement (CCE) on Tuesday, Feb. 5. 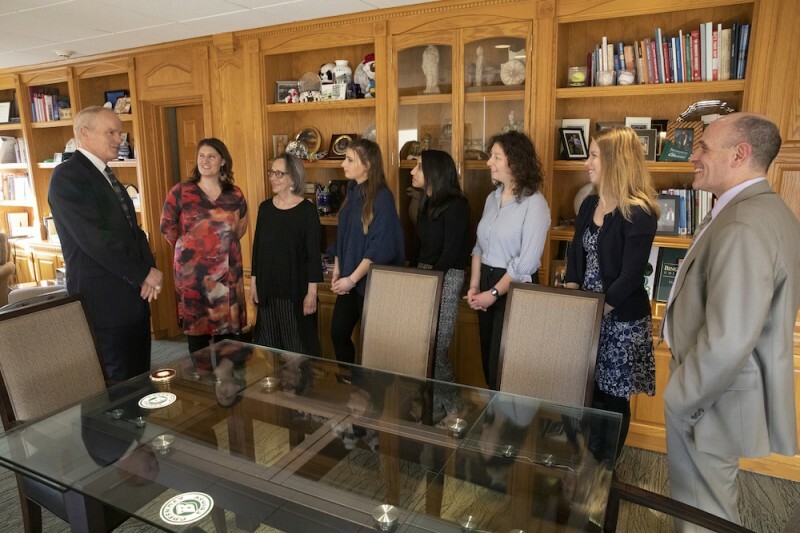 AGF Executive Director Sylvia Golbin Goodman, Vote Everywhere Program Director Karena Cronin and Dwyer met with senior University administrators, including President Harvey Stenger and Vice President of Student Affairs Brian Rose, staff from the CCE and current Vote Everywhere Ambassadors. This meeting was followed by a campus and community partner panel with other partners in Binghamton’s voter engagement work, including faculty, student groups and local community partners. Since 2014, AGF has funded eleven Binghamton University student Vote Everywhere Ambassadors, who have worked with the CCE to implement programs and reduce voting barriers for students, significantly increasing rates of voter registration, education and turnout on campus. Binghamton University’s student voting rate increased ten percentage points from 2012 to 2016 (one of the highest increases in the country), and the turnout rate at the on-campus polling place has increased during every election cycle since 2012, including during state and local elections. Over 1,400 students cast ballots at the on-campus polling place in Nov. 2018, quadrupling the number of students who voted on campus in 2014. Binghamton University received coverage in a New York Times article on college voter engagement efforts, highlighting our work to register students through a residential life voter registration competition. Voter turnout at the on-campus polling site was up 87 percent in 2017 from the previous comparable election. AGF was created in memory of Andrew Goodman, one of three college-aged young men murdered by the Ku Klux Klan during the 1964 Freedom Summer, a project aimed at registering African Americans to vote in Mississippi. For more information, contact Alison Handy Twang or Ben DeAngelis in the Center for Civic Engagement at 607-777-4287 or cce@binghamton.edu.